[New for 2015?] While perusing the freezer aisle of my local Stop & Shop (Giant to some of you), I spied this one a month ago. It was tempting, but I was waiting for the spring rush of new products to settle down a bit. Wow, that is one bright white ice cream. I start digging in to the very top layer and I hate to say it, but i'm not impressed. It seems like ultra light ice cream with a hint of marshmallow of a pinch of salt. It's not exactly a stellar first impression. I dig down further and it gets better, but not great. The ice cream is a bit more solid, but still minimal on flavor. Oh it's marshmallow, but it's a really light flavoring. It could have been worse, but I'm not getting any "toasted" notes. The pretzel chunks are occasional and not a huge factor. The pretzel swirl on the other hand... well, it does have it's moments. Every now and then you stumble upon a really thick layer of it and it's just a joy to eat. 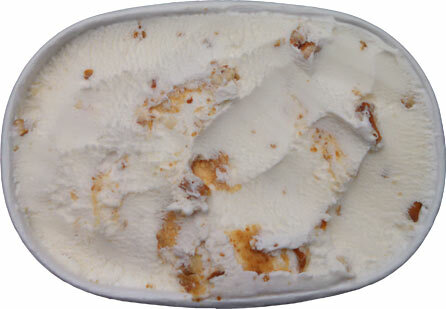 There is some familirity to the swirl in turkey hills' pretzel ice cream a few years ago. The bad news is the swirl has nothing to play off of. I mean, just look at these white puddles of nothingness and it's not even that hot today. This one is just turning back in to fluffly liquid. Ahhh, I don't even know how to describe how light and airy and flavorless these melted parts are and they spreading like wildfire. On Second Scoop: Alright, second scooping has been devoured. I'm still debating how I feel about this one, but I will start by saying that after I finished my cup of this one, I was tempted to go back for more. Granted part of that is because it's such a light feeling ice cream, but there are these moments when everything dials in perfectly and it's pretty enjoyable. I just wish every bite was like that. Sometimes the light marshmallow flavor is kind of undone by the light pretzel flavor and it gets a little frustrating. I mean, I love the pretzel swirl and all, but I'd rather see it somewhere else. Give me it in a chocolate base with chocolate chips and I'll be just fine. Wait, are you from New England? 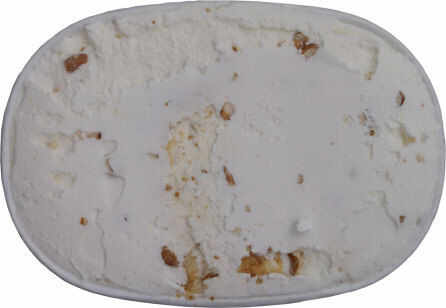 If you want a good toasted marshmallow taste, go and get Stewart's Happy Camper ice cream. I'm not sure where you are in MA, I was curious if you had tried/seen The Farmer's Cow ice cream. It's more of a CT product, but I live on the CT/MA border, and they carry it at Stop N Shop and smaller grocery stores. Hands down THE best cookies n cream ice cream I've ever had. 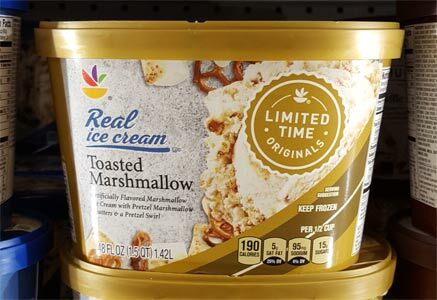 I havent seen it in stores but I have contemplated driving down to there "calfe & creamery"
Anon, I have had it and loved it. One of my favorite limited editions from Stewart's. I'm so thrilled to see you covering a Giant ice cream! It's a huge line; they seem to have every flavor. I loved one called something like Bear Brownie but they discontinued it. 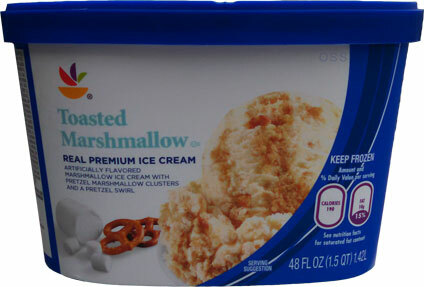 Has anyone tried the Stop N Shop/Giant brand premium ice cream pints? I have tried two of their pints but havent had any luck getting one that didnt feel freezer burned... which was odd considering the experience was months apart and at different stores. toffee wore me down and lava cake was too dry. it is cheap though, especially on sale, so if you get tempted to grab it, please let me know how it goes. I've tried the Giant ice cream pints and really like the Mud Pie one. It's got decent sized cookie pieces in it and a nice base. They go on sale quite a bit for $1.50 to 2.50 in my area. Agree with Dubba that the Lava Cake wasn't good at all and the caramel variety was also a no for me. Cheap is why I pick up the occasional Friendly's pint (can't argue when it's $1.99). 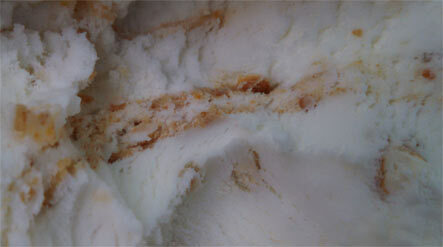 But for marshmallow, I'm partial to Gifford's Campfire S'Mores ice cream. It almost feels like sacrilege (I'm a Vermonter) but B&J's doesn't offer anything like that currently. I usually avoid store brand ice cream. Something has always tasted "off" about it and I have yet to disprove myself. My family never could afford the good stuff when I was younger. @Surfer: huge fan of Campfire S'mores http://www.onsecondscoop.com/2014/01/giffords-campfire-smores-ice-cream.html Store brands are usually "budget" ice creams and not as dense as mainstream stuff (let alone premium stuff). There are exceptions though as companies try harder. Shaws/SuperValu has a nice line up for the cost.